TwentyBN is a German/Canadian based AI startup that is using computer vision to redefine how people interact with technology. At NeurIPS in Montreal, Canada this week the company demonstrated a brand new computer vision based-avatar named Millie that is designed for retail and entertainment applications. 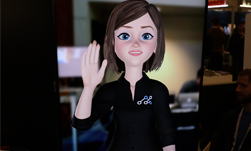 “Millie is a context-aware avatar that we’re showing for the very first time,” said Roland Memisevic, the company’s co-founder and CEO. “The deep scientific premise behind this project is that we believe that in order to teach a system to become smarter, to even have a conversation about things that are going on in the real world, you have to start with vision, you have to start with a camera, that’s what we did here,” said Memisevic. The company says they are at the beginning of Millie’s journey towards a more robust human-like AI. In the future, they hope to increase her skill set and human understanding. They add that she might even be capable of serving as a workplace assistant, dance instructor, and even a child’s learning partner. The company is targeting the retail sector and entertainment venues as possible use cases for Millie. The company is a member of the NVIDIA Inception program, NVIDIA’s AI startup incubator program. To learn more about the program visit our website.